Also serving communities of Saugus. There are 226 Assisted Living Facilities in the Santa Clarita area, with 8 in Santa Clarita and 218 nearby. The average cost of assisted living in Santa Clarita is $4,127 per month. This is higher than the national median of $3,346. Cheaper nearby regions include Newhall with an average starting cost of $3,298. To help you with your search, browse the 581 reviews below for assisted living facilities in Santa Clarita. On average, consumers rate assisted living in Santa Clarita 4.2 out of 5 stars. Better rated regions include Granada Hills with an average rating of 4.7 out of 5 stars. Caring.com has helped thousands of families find high-quality senior care. To speak with one of our Family Advisors about assisted living options and costs in Santa Clarita, call (855) 863-8283. The city of Santa Clarita was established in the 1850s and much of the city's history can been seen by walking about town. Seniors an explore the town's history, art, parks, and pools or take a day trip to nearby San Francisco, only 45 minute away. Assisted Living Facilities in Santa Clarita fall under the umbrella of Residential Care Facilities for the Elderly (RCFE). RCFEs are held to high standards of quality put in place by the California Code of Regulations Title 22 , Division 6, Chapter 8. There are 57 facilities around Santa Clarita, with 8 located in the city and 49 in cities nearby. Santa Clarita is located in California, one of the sunniest states in America. This can be both a blessing and a curse, as the average temperature is usually much higher than the national average, even in December. On average, there are 280 sunny days compared to the U.S. average of 205. Summer highs in July reach 93 degrees and the January low is 43. Santa Clarita, like much of California, is known for having poor air quality. There is a lot of pollution due to an excess of cars and other vehicles on the roads, and this makes for occasionally hazardous conditions, especially in the summer months. California is a highly sought-after place to live, so its cost of living is much higher than the national average. This means that assisted living facilities can be much more expensive here than in other cities, as everything is priced higher. Santa Clarita has a cost of living index of 148.9, higher than the national cost of living index of 100. Housing is the biggest factor in the cost of living difference, which impacts the cost of assisted living facilities. The crime rate in Santa Clarita is better than 38 percent of American cities. The rates of both violent crimes (1 in 529) and property crimes (1 in 60). such as robberies, are much lower than California as a whole (1 in 225 and 1 in 39, respectively). Santa Clarita offers a wide variety of senior-friendly transportation services. One example is Dial-a-Ride, a service offered especially to seniors over the age of 60 who have disabilities or other age-related issues. There are also buses and car services geared toward seniors. There are many opportunities to take in arts and culture in Santa Clarita. There are museums, theaters, workshops, art classes, among other things. Assisted Living costs in Santa Clarita start around $4,127 per month on average, while the nationwide average cost of assisted living is $4,000 per month, according to the latest figures from Genworth’s Cost of Care Survey. It’s important to note that assisted living rates in Santa Clarita and the surrounding suburbs can vary widely based on factors such as location, the level of care needed, apartment size and the types of amenities offered at each community. 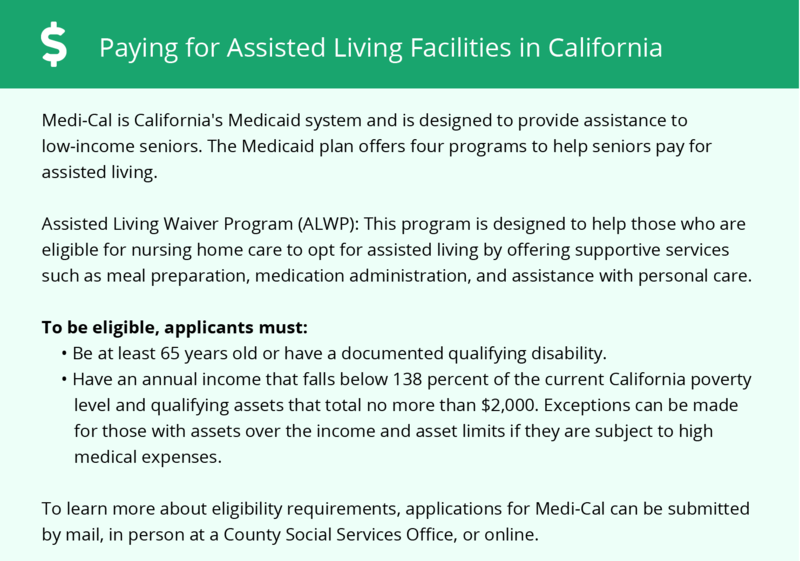 Eligible seniors can apply for financial assistance for assisted living via programs like Medi-Cal (California Medicaid). 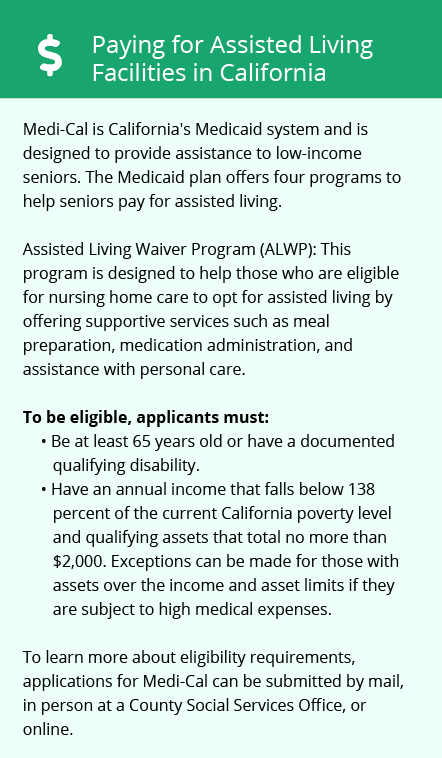 Low-income individuals who prefer to live in an ALF rather than a nursing home may also receive help through the Assisted Living Waiver Program. To see a list of free assisted living resources in Santa Clarita, please visit our Assisted Living in California page. Santa Clarita-area assisted living communities must adhere to the comprehensive set of state laws and regulations that all assisted living communities in California are required to follow. Visit our Assisted Living in California page for more information about these laws.